A mysterious find is this unassembled box for household detergent powder. Was it a printer’s proof for a product that never actually launched? I like this time of the year because inevitably, one or two people visit and bring me a suitcase from New Zealand of the accumulated crap I’ve bought at online auction. It’s a big ask – but for some reason they agree to do this because my insanity…I mean…enthusiasm is so inspiring. Yeah, that’s it. Enthusiasm. It’s really catchy, like a communicable disease. Not only a great design, but quite a curiosity, I thought. It’s hard to tell if this was rescued from a manufactory and so never run through a machine and die-cut into a box – or if it was a printer’s proof for a product that never made it to fruition. I’m edging towards the latter, given that I’ve never seen a single example of product or advertising for Dash in Aotearoa (not that I’m claiming to know or have seen anywhere near everything). If this is so – it would make it an extremely rare item, and one I am pleased to say I snapped up at an absolute bargain at just a couple of bucks with zero interest from any other collectors. 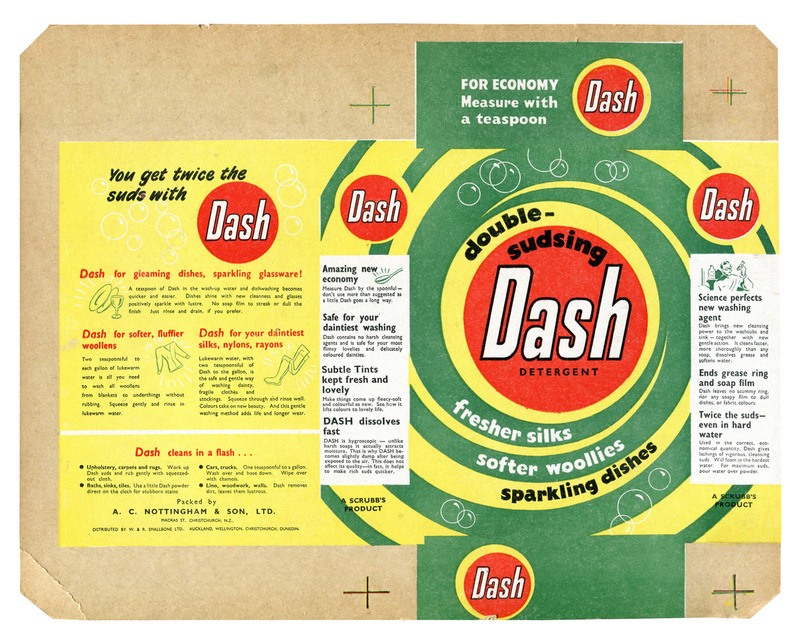 Records show that The P&G Company registered Dash as a trademark in New Zealand in 1958-1959 (no mention of Scrubb’s, or the manufacturer, or even distributor on file in connection). The fact it’s under (the very appropriately named) Scrubb’s could indicate that the English base acquired the American rights to manufacture and distribute the Dash brand in their jurisdiction. However since P&G registered the rights themselves I’d say that the (proposed) manufacturer, Christchurch-based A.C. Nottingham & Son, made the decision to slot the washing powder under an already successful brand to piggyback off it’s good sales and reputation. A. C Nottingham & Son was established by Arthur Charles Nottingham (1860-1929). His son Robert Hilary Nottingham (1897-1974, the obviously favoured of Arthur’s impressive number of twenty children) was admitted as his partner in July of 1920. Arthur had a varied career in England, Australia and New Zealand before establishing himself as an agent – and by the early 1900s his client roster included Speight’s Ales, Penfold’s wines, The Royal as well as the British Foreign & Marine insurance companies, Perrier Champagne, Sanderson’s whisky, and Jeyes’ disinfectant and sheep dip. 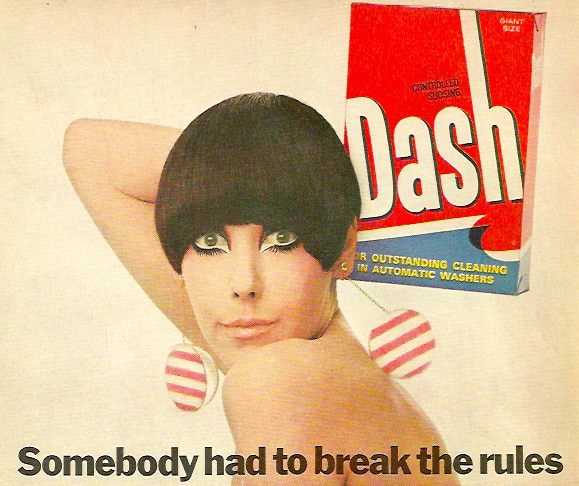 American advert for Dash with one of my all-time favourite models Peggy Moffatt, June 1967. During this period, the box design was primarily red with a little blue. As time went on the Nottingham business came to specialise in household cleaners and the like – both the aforementioned Scrubb’s ammonia, and Jeyes’ Fluid (the latter still available) were staples of household cleanliness down under from at least the 1920s onwards. In fact the Nottinghams really went to town with the Jeyes’ brand producing toilet soap, sanitary animal powder, horticultural wash, and Cyllin throat pastilles and lozenges in the 1920s, as well as shaving cream. Then in the 1950s the introduction of Jeypine disinfectant was a huge success, in fact I think it was around well into the 1980s in original and lavender versions as far as I remember – and may even still be going today. 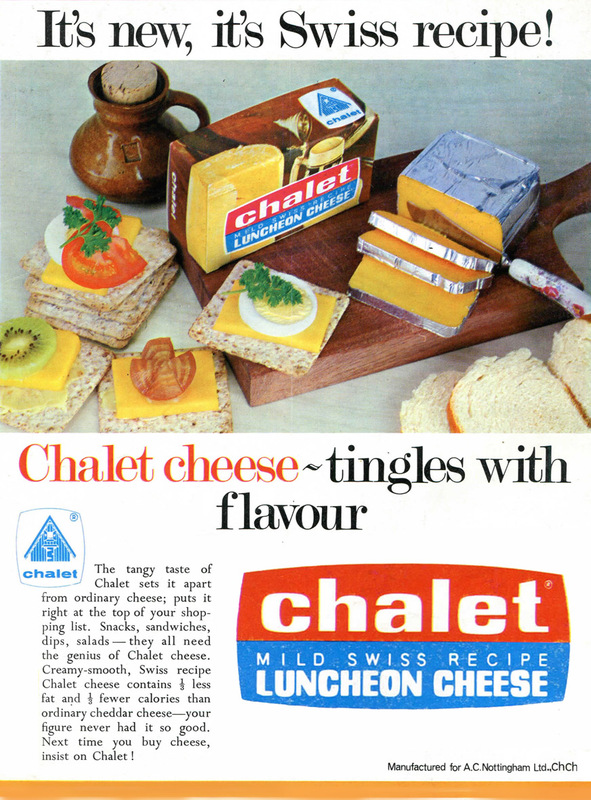 I also have a recently-acquired advert for Chalet of the late 1960s, a foil-wrapped process Swiss, showing that there was more to this company than a narrow cleaning product genre. They also dabbled in tea (the Kalana brand) and took a stab at pet products with soap for dogs in the Twenties, Fisolene paint products in the Fifties, and toilet paper again under the Jeyes’ brand in the 1970s. Two adverts for Camfosa disinfectant: On the L shows that Smallbone and Nottingham had a strong business relationship in this one from the Woman’s Weekly, Feb 1962. Image on n R from the Evening Post, Feb 1925, courtesy of the National Library of New Zealand. Smallbone were better known as manufacturers in later years rather than handling the products of others, however Walter Smallbone (1862-1941), like Nottingham, had also started out as an agent and importer in the 1880s in Wellington. Of course this story was bound to come back to food – he handled Hudson’s biscuits and confectionery but it turns out he had also had a stint as manager of the Wellington branch of Hudson’s for a time. Smallbone also represented products from Thistle (McFarlane’s line of jams and canned foods), Suchard Chocolates, Household Delight washing cream for laundry, Robertson’s Golden Shred marmalade, Tiger Tea, I.X.L. borax and extract of soap, and Flag (The Hayward Bros lines of sauces and pickles). Coincidentally this week I also acquired evidence for a product that I never would have guessed Nottingham branched into: cheese. This Chalet advert from NZ Woman magazine, November 1968 . The R. Smallbone part of the equation was Reginald Edward (1876-1961) who had the majority of his career on the sea. At one time he was superintending engineer for Sanford Limited, a major seafood business still operating (yet another food connection) and was rather good friends with the owners – so both brothers were very well connected in the industry with some major players. At some point Smallbone had moved from simply representing – to actual manufacturing – and were behind Camfosa, a very successful disinfectant (and soap) from the 1920s for at least five decades. Dry-Bright polish was a brand of the 1950s. (Bon Brushes Ltd also had a brand of polish called Bon’s Dry-Bright so it’s likely that Smallbone, perhaps with Nottingham’s involvement, had a finger in the pie of this Christchurch based business or perhaps even owned it at some time). Smallbone produced their own self-named cloudy ammonia in the Sixties as well as Liksopyne disinfectant and Sprayforma room freshener. They manufactured the Vincents brand of powders and pills, and acted as agents for much in demand Quickshine floor and furniture polish. A variety of Smallbone and Nottingham products: From L Clever Mary (poss late 1950s), Scrubb’s ammonia bottle (poss 1950s), Camfosa (1950s), Jeyes’ Fluid bottle (poss early 1960s), Clever mary (poss early 1960s), Jeyes’ Fluid bottle (poss early 1960s). Not satisfied with household products, they became owners of the franchise for Renault Cars from 1961-1967. Renault’s Dauphine models were assembled by Todd Motors’ Petone, Wellington plant under contract to Smallbone. This may appear quite a departure but seemingly the Smallbone family had other business interests in car dealerships, maintenance and car parts. The succeeding director, one of Walter’s children, N.R. Smallbone – passed away in 1969 – and it seems that Smallbone wound down in the early to mid 1970s. Nottingham seem to have been around until the early-mid 1980s (don’t quote me on that). I believe that this box dates from the very early 1960s when, P&G, looking for someone “to take care of things” domestically, handed it over to Nottingham with Smallbone handling distribution. There’s no further mention of it so it may have been stalled or been short-lived in a market crowded with other products like Lux, Velvet, Laundrine, Taniwha, GHB, Waxine, Suds, Jet, Sunlight, Surf, St. Mungo, Rawleigh’s and of course Reckitt & Colman and Lever Brothers brands. 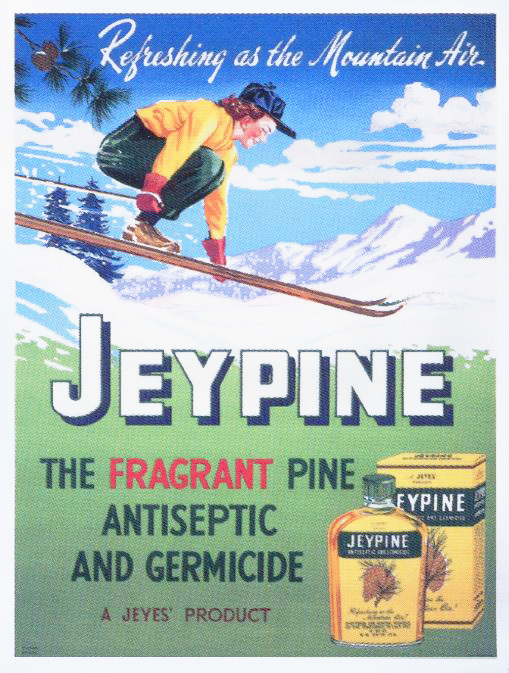 Nottingham’s Jeypine (in later decades adjusted to Jey Pine) disinfectant produced under the British Jeyes’ license, in a poster of the 1950s. 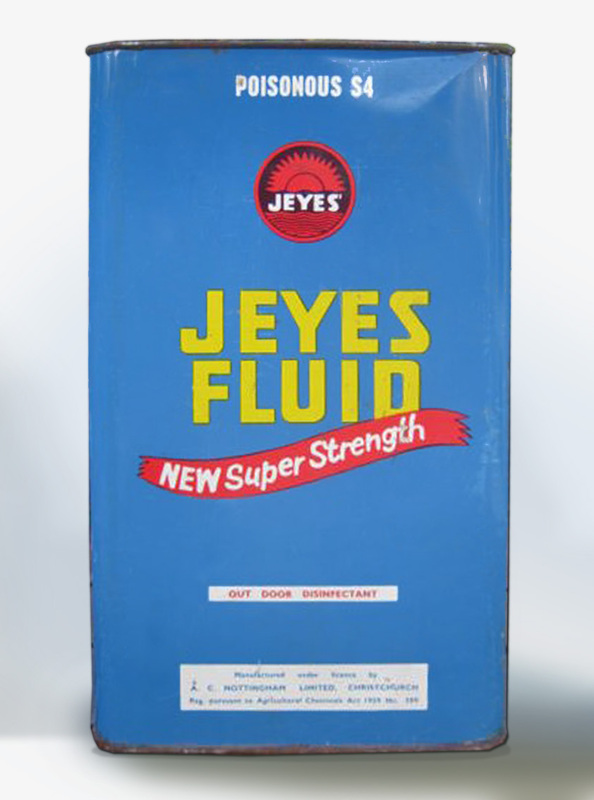 Addendum early Now 2015: This unusual bulk tin for Jeyes Fluid by A.C. Nottingham, recently appeared at auction. I’d estimate it dates from the 1970s.